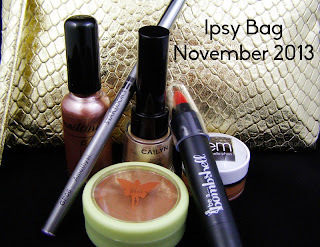 My Ipsy bag arrived a week or so ago. It seems like it gets later and later...and now, I've noticed that I don't get my shipping confirmation until a few days after it was posted...they think they are so clever. Regardless of the shady practices, I'm happy with the quality of products (for the most part) that I received this month. my camera hates the gold. It's a perfectly nice bronzer...but man is it dark. I don't know if I'd buy this color again, but I like the subtle shimmer and the wear-time. It lasted about 3 hours on my wrist. I wasn't careful about it either. It is definitely worth checking out if you like shimmer bronzers, I'm just personally more fond of matte. Holy fallout, Batman! This applicator is trouble! While I really like the bright gold/champagne color, it was an absolute mess to apply. I think I may crack this open and try pressing the shadow, since it is so nice. The sparkle in it is right in between shimmer and omgglitter, which is great for this time of year. I just wish they hadn't tried to be so creative with the packaging...not to mention it looks like an old Revlon bottle. Very confusing for the polish obsessed. I really think this stuff is great. 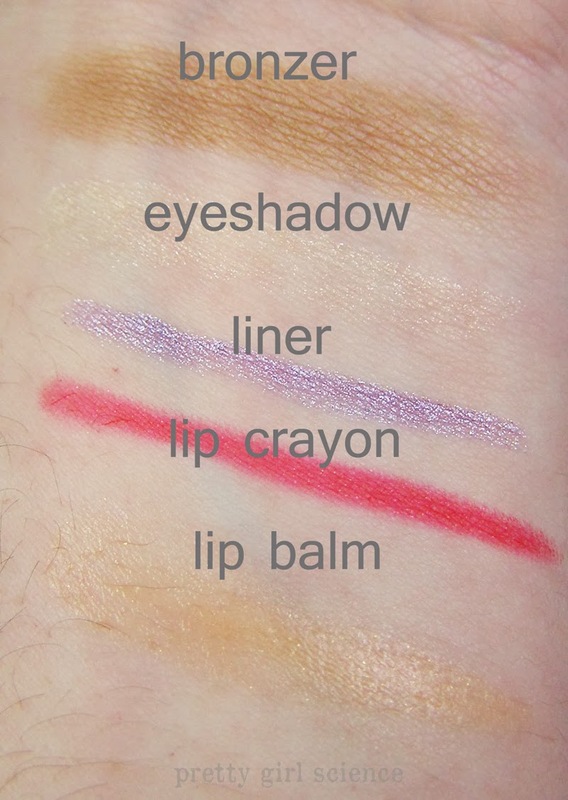 Super pigmented, smooth, and long lasting. I wore it as an eyeshadow, and it did crease a bit...but it blended out easily, and made me glittery and happy. I am looking forward to trying this out as a regular liner. 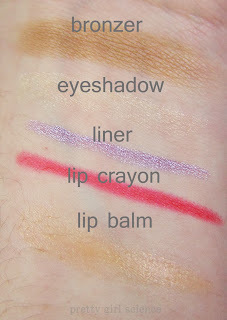 The creamy formula lets it glide gently across the skin, which is unusual for pencil liners in my experience. Hot Damn. This is red. It lasts fairly well, and I think this particular color would be flattering on a lot of different skin tones. It has a tiny gold shimmer to it, but its hardly noticeable on the lips. Which is good, because I don't like super-shimmery lip products. A definite improvement over the Pop Beauty Crayons I was sent previously. Ugh. Do not want. I got "vanilla" which is a light toffee/caramel color with gold shimmer. It does not suit me much, and even if it did...I wouldn't wear this stuff. My lips definitely did not feel moisturized, nor did they look "plush". The taste/smell is also a bit unpleasant for me. It's reminds me of artificial vanilla/caramel flavoring. Boo. Another tick in the "bad" column is the formula. It is like sticky vaseline. It reminds me of the HiP lip jellies...but after you leave them in your car for a day and night. The balm didn't spread very well, and it remained sticky until it wore off, which was blessedly soon after application. This is my second Nailtini, and the brand is growing on me. The color I received, Champagne, is like a better version of China Glaze Camisole. It's a little less brush strokey, and a little more coppery. I really like it. I think it benefits from a gentle sponging, like most metallics. I think this would be awesome on medium-to-deep skintones. You'll notice that I didn't post a look made with the contents this time. I used the amethyst liner as an eyeshadow, but it creased and made me unhappy. I just couldn't see how I could work everything into one look and not look like a clown. Apologies on that, hopefully next month it won't be so weird. Overall, I'm not sorry I got this bag. There were a couple of really neat things...and one kinda-awful one. I was hoping I would get the sheer lipstick from em because I like that sort of thing...but I didn't. I got an icky balm instead. If this balm is indicative of the quality of her line...I'll be passing. I can't afford the prices if the quality isn't there. As always, if you want to check out Ipsy you can use my referral link and help me get some free stuff.